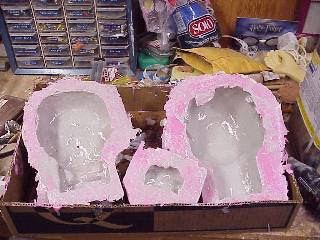 Since I had to mix urethane to cast Sonny's jaw, I decided to do the whole head that way. The molds are in two halves, front and back, so slush casting is tedious. I had to slowly slush the wet urethane around each half being ever so careful to keep it from spilling over the rims until the urethane set up. That takes at least a half an hour per cast. If you set the mold/cast down before that, the stuff is still flowing enough to settle in deep pools in the low spots. I don't have the patience for this kind of work, but I did it. 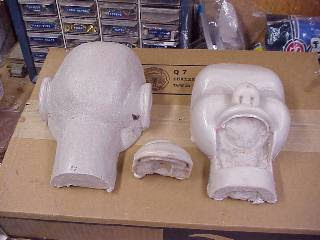 Here are the casts in the molds ready to be de-molded. No matter how many times I do this, the cast is never thick enough in places. It can be paper thin and pliable even to the point of tearing. I had to add layers after I thought I was done. Even then, the edges will need to be reinforced before I assemble the two parts. Here are the casts, demolded and ready for some finish work. You might wonder about that black spot under the right ear. 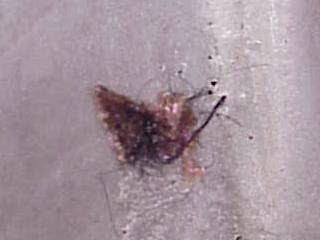 That is a small moth that got into the process sometime during the molding and casting processes. Here's a closeup. Something makes me want to leave that moth there. It would be hidden by the wig, but I'd know it was in there, representing the many years that Sonny lay silent in an attic storage trunk with only moths to keep him company. But I'll probably allow pragmatism to prevail over sentiment and debug the figure.